Audi has revealed a series of mid-life updates for the R8 ahead of it going on sale in the UK early next year. The McLaren 570S rival benefits from exterior revisions, a power boost and tweaks to improve handling. Visual changes for the 2019-model-year update are subtle but include a redesigned grille with 3D optics for a honeycomb effect and the removal of the aluminium bar that crossed the grille of the old model. Darker headlights with black-trimmed surrounds have been added and a new spoiler wraps around the front of the car and continues into the deeper side skirts. The air intakes behind the doors have been enlarged for greater cooling potential and a new full-width honeycomb grille at the rear serves the same purpose, as well as adding “more visual aggression”, according to Audi. 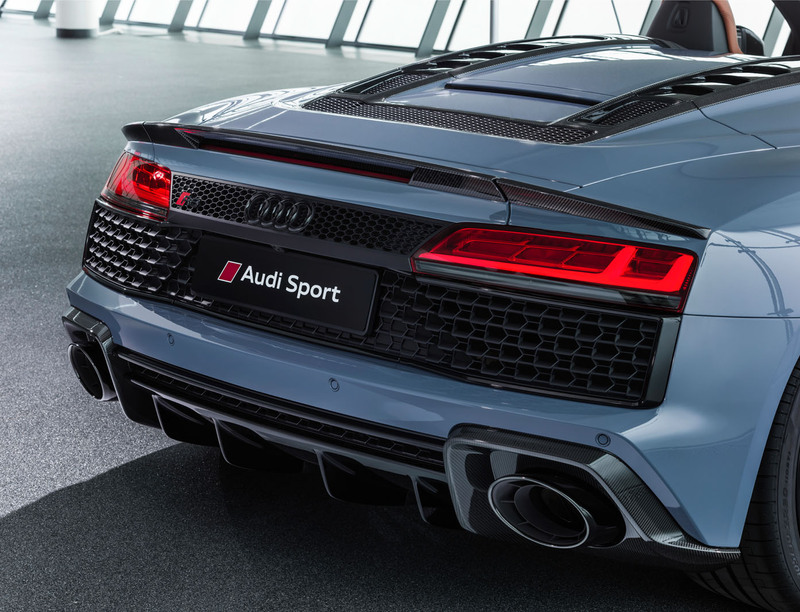 The tailpipe design has been changed from rectangular to oval, with the exhaust surrounds made from matt black titanium on the R8 V10 Performance — new branding that replaces the old V10 Plus. Fresh colour options, such as the Ascari Blue of the car pictured here, and additional 19in or 20in alloy wheel designs also feature, including special forged items for the Performance model. An optional black exterior package brings black badging front and rear, and grey matt and carbon side blades are also available. Other than some new Alcantara trim, the interior is all but unchanged. The big news mechanically is the changes to the 5.2-litre V10. ECU and other revisions boost the standard R8 from 533bhp to 562bhp, with torque up by 10lb ft to 406lb ft. The Performance, expected to be the biggest seller, takes it a step further again thanks partly to a new titanium valve train, with power rising from the old V10 Plus’s 603bhp to 611bhp and torque by 4lb ft to 417lb ft. The standard car is now capable of 0-62mph in 3.4sec (3.5sec for the Spider) and the Performance in 3.1sec (3.2sec for the Spider). The power boosts help offset the addition of 20kg worth of emissions-reducing tech to both models to ensure they meet the new WLTP regulation standards. 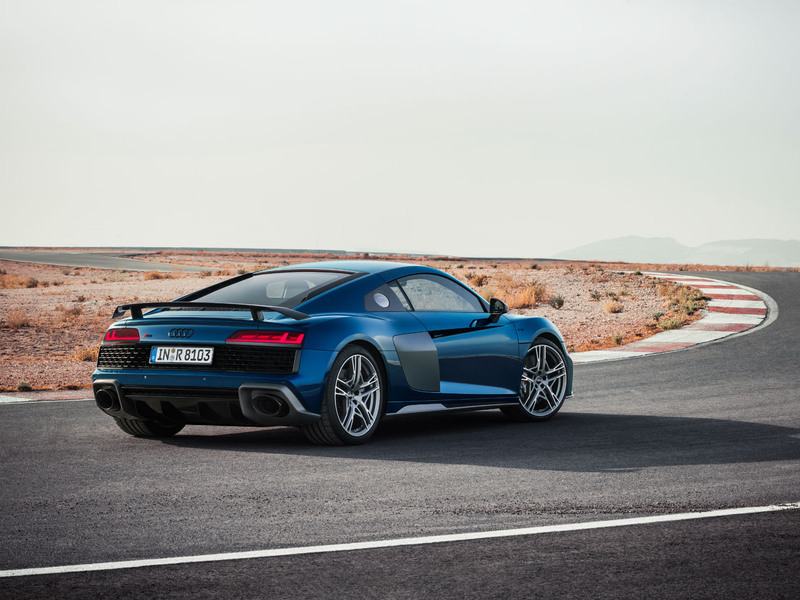 Audi has also revised the R8’s suspension settings for “even more stability and precision”, while both the standard and dynamic steering systems have been retuned for greater response and feedback, and more discernible differences between the drive modes. New Michelin tyres are said to have a longer life and more grip and, combined with the retuned ABS system, give a 5m reduction in stopping distance from 120mph. Pricing for the R8 is expected to be similar to that of today’s model. The nicest TT they make. That said the Carlos Fandango exhausts do look rather silly. No, it’s not bad, brining the blades back is fine, the rear end tidy up is ok, those Exhausts are huge! One of the very few facelifts I've ever seen that improves the car (The old Jaguar XF and Rolls Royce Phantom come to mind). Love the added aggression aside from the slightly OTT exhausts. Just wish we had the full-length sideblades back! The new nose looks like it belongs to a different car and the boy-racer, bean-can exhausts just look plain silly. A fancy TT or a McLaren? The nose is another oragami mess of unrelated lines. Why do makers keep doing this? We'll look back at this in years to come like we look now at 70's flares. With your stupid TT comment you only show that you have no clue. And this is not another turbo-charged performance vehicle like McLaren, R8 is special. Another old fashioned dinofuel car. Boring. Yes because electric cars are exciting.... Not! A discerning buyer and one with taste would simply dismiss this creation from the barbarian hordes and choose the premium option that is the Jaguar F-Type. Superior in every metric to this inferior vehicle. They may have accumulated the funds to purchase such a vehicle but any lack sense and judgement. Those who choose this, choose failure.